Inspired by reading “Griftopia” by Matt Taibbi, I thought I’d pick up a new book. 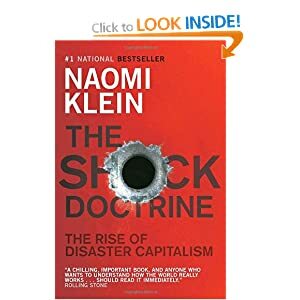 I got “Shock Doctrine” by Naomi Klein. But, before I say anything more about Shock Doctrine, I want to say a bit more about Griftopia. Something that jumped out at me at the end of the book was when Taibbi talked about how most of the government’s operations are hidden from us. And, what’s worse, a lot of it is that way because we prefer it that way. One reason is that being informed about these issues takes work. Just reading this book was kind of tough sometimes. I’m not a numbers person. But, I can do pretty well with ideas and concepts. The chapters that talked bout credit default swaps, derivatives, and collateralized debt obligations were not easy to get through and I still feel like I have a weak understanding of the concepts at best. But, I do know the larger picture, that banks deliberately and knowingly built up fraudulent practices such as insuring things they didn’t own, or lying about the quality of the products they were selling to boost the prices they got for them. These are the kinds of things that land you and me and jail. But, the banks not only got away with it, they rewarded themselves for it. Listen to the news. It’s right there. I listen to NPR almost every single morning and afternoon. In the morning, my local station KVCR has a 15 minute segment on finances. Do you have any idea how many corporations are actually making record profits right now? We are in the middle of a recession (does it feel like it’s ending to you?) and corporations are taking record profits? Doesn’t that seem odd to you? And, yet, jobless claims are rising again. Can you guess how corporations are taking these profits? Prices for things are not going down but the number of employees are. Don’t even get me started about the price of gas and the blatant manipulation of those prices. Taibbi pointed out how every story in politics, no matter how complex, gets boiled down into two narratives, one for the Fox News crowd and one for the MSNBC crowd. The Republicans pound one set of talking points and the Democrats the other. It’s pretty ridiculous. And sad. Because it means we aren’t getting real information and we can never get a chance to do something meaningful about it. Those “reforms” that President Obama is so proud of? They are to meaningful reform as running a vacuum over the carpet is to remodeling a room. As in, it’s not even close. But, it won’t matter, because it takes a lot of work to understand health care, or credit cards and then a new story pops up like a government shutdown, or revolution in the Middle East, or union busting in Wisconsin or whatever. And the memory fades. The story drops down the Memory Hole. So, really, if you love your country, do some reading. At very least, stop watching network news and listen to NPR (and if you’re a conservative, it’s okay. Trust me. NPR is way less biased than you’ve been led to believe. Try listening for a month and see. Read a couple of papers. But, even better, get on Twitter and follow some people you like and trust who can start pointing you to stories in alternate press sources. Get better information. See what I mean? It takes work. No wonder they keep getting away with it. So, on to Shock Doctrine. I just barely started it. The book proposes that the people in government and business who subscribe to pure capitalism use disasters to take over new markets or push through “reforms” that would have otherwise have been politically impossible. It works because the people are trying to cope with the disaster and put their lives back together and they get too distracted to fight back. It’s why they were able to basically privatize the public education system in New Orleans right after Hurricane Katrina. The majority of schools in New Orleans are now charters.